2010 Hirsch Vineyards, Pinot Noir San Andreas Fault Hirsch Estate, Sonoma Coast. 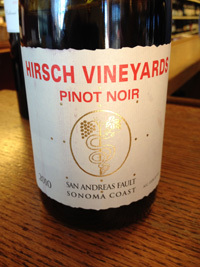 The new release of Hirsch San Andreas Fault Pinot is strikingly intense, very Nuits-St.-Georges like (think Henri Gouges) with a real meaty and earthy nose that hints of wild truffles, a faint whiff of dried roses and saline, plus balsamic dipped plums before opening up on the beautiful and textured palate that gives way to an array of red fruits, savory spices and soft mineral tones. Jasmine Hirsch and new winemaker Ross Cobb can be proud of this finished effort, this is an intriguing example of Sonoma Coast Pinot Noir that delivers a richly packed wine with plenty of vigorous tension and vivid transparency. There are layers of morello cherry, dried currants, dusty raspberry, salted licorice, lavender oil, porcini and warm wood notes, which leads to a stunningly long finish with a lingering pure Pinot fruit and violets aftertaste. This Pinot Noir combines power, terroir and graceful balance in a dynamic package, this Pinot is well worth searching out, bravo, drink 2014-2020.